(Nanowerk News) Northwestern University researchers have developed a first-of-its-kind technique for creating entirely new classes of optical materials and devices that could lead to light bending and cloaking devices — news to make the ears of Star Trek’s Spock perk up. The study was published online by the journal Science ("Building superlattices from individual nanoparticles via template-confined DNA-mediated assembly"). Mirkin and Vinayak P. Dravid and Koray Aydin, both professors in Northwestern’s McCormick School of Engineering, are co-corresponding authors. 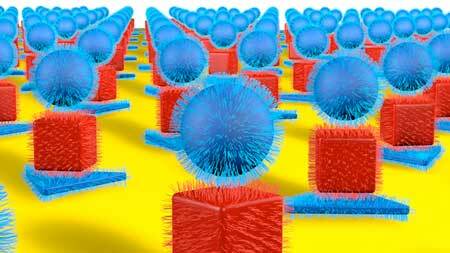 “Our novel metamaterial platform — enabled by precise and extreme control of gold nanoparticle shape, size and spacing — holds significant promise for next-generation optical metamaterials and metasurfaces,” Aydin said.